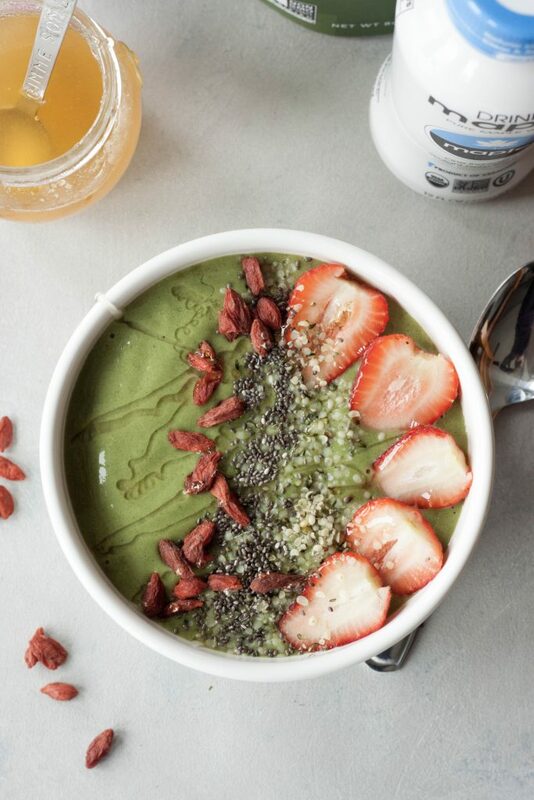 It’s Monday and this mama needs a Energizing Matcha Smoothie Bowl for breakfast! As I mentioned in last weeks post things are a little crazy around the house and I’m a little drained but trying to stay fueled with healthy nutrition as much as possible to keep me at my best and to cope with stress and keep up. Coffee isn’t agreeing with me much but I need/want it more then ever. When having coffee making sure to have it with a cashew or almond milk, in a favorite blend with a banana I’ll be posting soon. Matcha is a perfect alternative that I love. I find matcha so relaxing yet still energizing when I need it, it’s strange how it can be both. Since S got braces last week and smoothies/smoothie bowls are easy they are in regular rotation around here. I like to start with maple water for this one to switch things up otherwise I go with my standard coconut milk or another dairy free milk. Maple water is hydrating, high in magnesium, minerals, antioxidants, and electrolytes. It contains half the sugar of coconut water. You could also use coconut milk. My personal favorite blend is maple water, matcha, frozen banana and avocado, frozen pineapple, spinach, maca, and half a scoop of vanilla protein when I need it. I like to use both bananas and avocado as it’s the perfect balance of sweetness for me and is less sugar then using just banana but avocado only isn’t quit sweet enough for me in this bowl. Slight tropical hint with the pineapple and healthy greens with spinach. Topping options are endless, they really are and it’s great to switch things up based on your mood and cravings. I either know what I want or spend more time thinking about toppings then it takes to whip a smoothie bowl up and eat it. Opening the cupboards and fridge, usually finding so many options and then have to narrow it down. Sometimes decisions are so hard. The one pictured is just one of my favorite combos with hemp seeds, chia seeds, goji berries, strawberry slices, and bee pollen honey drizzled over top. I switch it up depending on my mood sometimes adding other dried or fresh fruits, coconut, nuts, a chopped Go Macro Bar, muesli or granola clusters, and sometimes coconut butter. This recipe is like many of my creations in that it’s meant to inspire you and be customized to your personal tastes and what you need, like, and have on hand. Very versatile and great for breakfast or my favorite a snack as it gives me the boost I need to get through busy soccer mom nights. 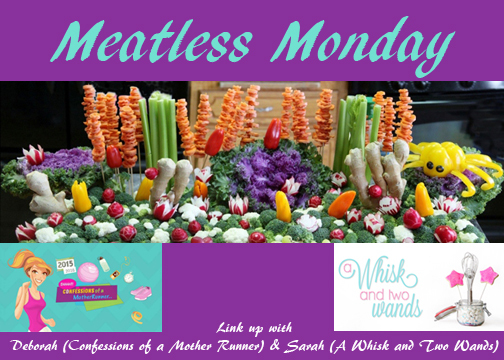 Since it’s Monday it also means it’s Meatless Monday! My co-host Deborah and I hope you are inspired by one of the many meatless recipes below. Have something to share, we’d love to have you join us in the link-up. 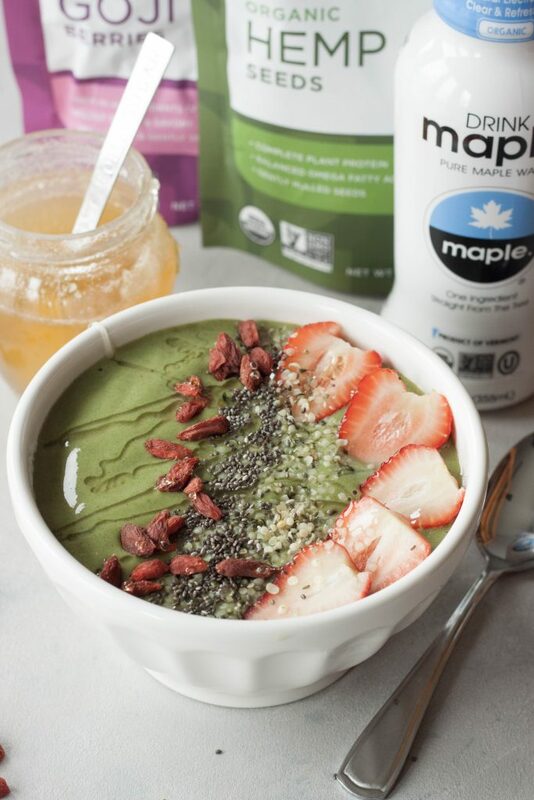 *Shown with Navitas Organics hemp seeds, chia seeds, and goji berries. Fresh strawberries, and Bee Pollen Bare Honey. 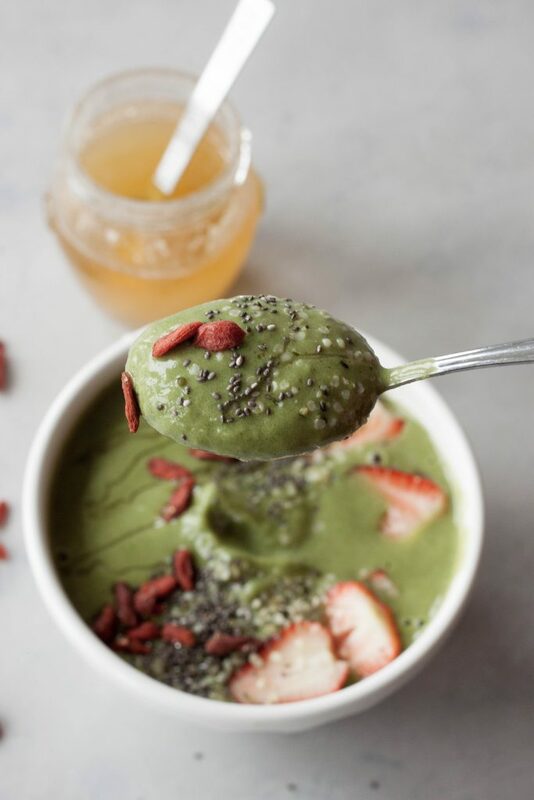 In a Vitamix, or high-speed blender, blend water, matcha powder, spinach and protein and any other optional powders you are adding. Add in frozen pineapple, banana/avocado and using the tamper tool as needed blend smooth and until desired consistency is reached. Pour/spoon into a bowl and add toppings of choice. Enjoy! I haven’t had matcha in so long – this looks delicious! I go in phases but when tummy isn’t handling coffee well or in the afternoons lately it’s my go to again. Thank you, and thank you for joining us! Craving your peanut butter popcorn right now! This reminds me that I need to still figure out how to use the matcha I have lol. This looks like a good way! This would be a great way to use it up! 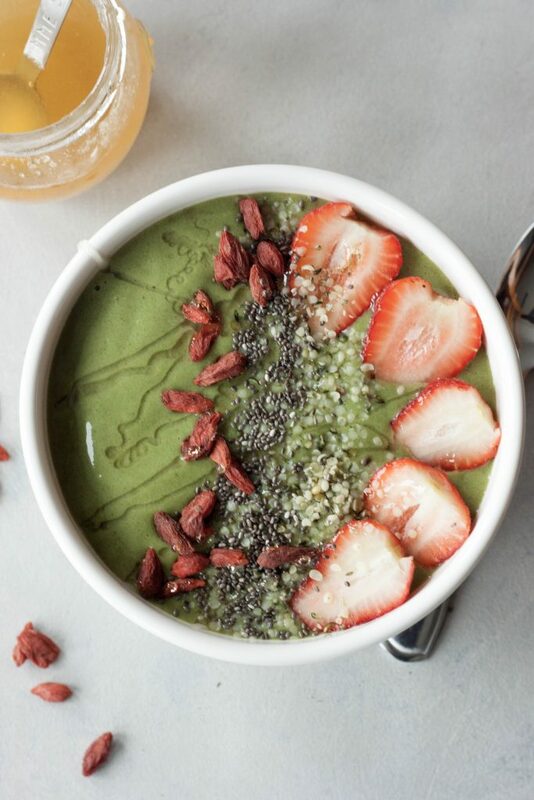 You know I’m all about the smoothie bowls! :D! This looks so good! <3 I need to try making this! I hope you do, I think you’d love it! I was just pulling out some matcha today to make a recipe, and spotted this. I think this bowl may need to get made, too!